“This volume continues the Naxos series of Rubinstein’s ‘middle period’ Chopin recordings, begun with the Piano Concertos (8.111296) and followed by the Polonaises (8.111346). Because the HMV/Victor catalogue already included Cortot’s complete traversal of the Waltzes (8.111035), Rubinstein set down only two of them on shellac before making this complete recording in 1954. He had made previous recordings for RCA of two of the Impromptus (Opp. 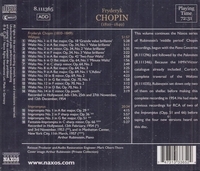 51 and 66) before taping the four new versions heard on this disc. Warm, lyrical, and aristocratic in his interpretations, Arthur Rubinstein performed impressively into extremely old age, and he was a keyboard prodigy almost from the time he could climb onto a piano bench. He came from a mercantile rather than a musical family, but fixated on the piano as soon as he heard it. At age three he impressed Joseph Joachim, and by the age of seven he was playing Mozart, Schubert, and Mendelssohn at a charity concert in his hometown. In Warsaw, he had piano lessons with Alexander Róóycki; then in 1897 he was sent to Berlin to study piano with Heinrich Barth and theory with Robert Kahn and Max Bruch, all under Joachim's general supervision. In 1899 came his first notable concerto appearance in Potsdam. Soon thereafter, just barely a teenager, he began touring Germany and Poland. After brief studies with Paderewski in Switzerland in 1903, Rubinstein moved to Paris, where he met Ravel, Dukas, and Jacques Thibaud, and played Saint-Saëns' g minor Concerto to the composer's approval. That work would remain a flashy Rubinstein vehicle for six decades, and it was the concerto he offered in his American début with the Philadelphia Orchestra in Carnegie Hall in 1906. His under-prepared American tour was not especially well-received, though, so he withdrew to Europe for further study. Rubinstein became an adept and sensitive chamber musician and accompanist; his 1912 London début was accompanying Pablo Casals, and during World War I he toured with Eugène Ysaÿe. He gave several successful recitals in Spain during the 1916-1917 season, and soon toured Latin America. Along the way he developed a great flair for Hispanic music; Heitor Villa-Lobos went so far as to dedicate to Rubinstein his ‘Rudepoema’, one of the toughest works in the repertory. Although Rubinstein would later be somewhat typecast as a Chopin authority, his readings of de Falla, Granados and Albéniz would always be equally idiomatic. Rubinstein's international reputation grew quickly, although he was by his own account a sloppy technician. In the mid-1930s he withdrew again and drilled himself in technique. By 1937 he reemerged as a musician of great discipline, poise, and polish - qualities he would mostly retain until his farewell recital in London in 1976, at the age of 89. Rubinstein's temperament had sufficient fire for Beethoven but enough poetry for Chopin; his tempi and dynamics were always flexible, but never distorted. His 1960s recordings for RCA of nearly all Chopin's solo piano music have been considered basic to any record collection since their release, and his version of Falla's NIGHTS IN THE GARDENS OF SPAIN is another classic, as are his various late collaborations with the Guarneri Quartet.